As parents, we’re always looking for ways to strengthen the relationships we have with our kids, and also the ones that they have with each other. Let’s be real—sometimes kids argue, and they don’t always get along. Ours are no different, but despite that, they do love each other, and giving them a way to express that has been key in our family. Several years ago, I was looking for a way to celebrate each other and our family during the Valentine holiday, and Love Buckets came to be. 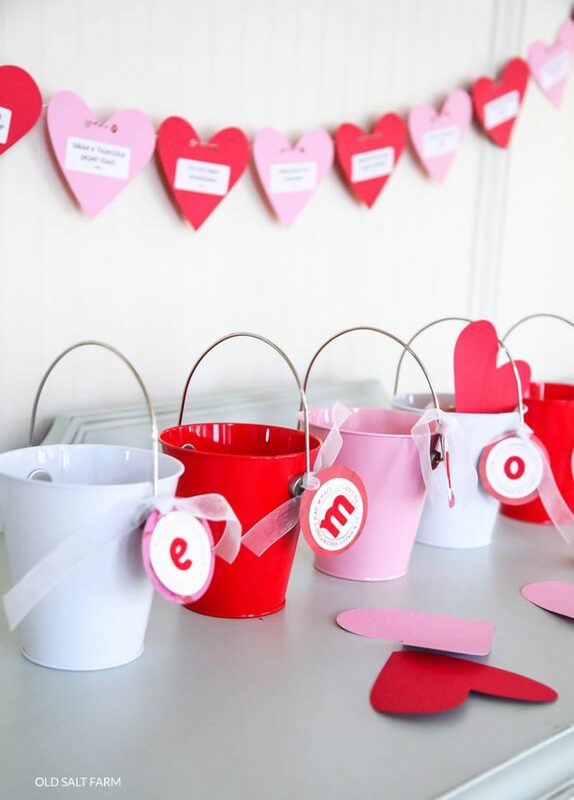 I found cute metal buckets—one for each person–then cut out some hearts out of scrapbook paper and cardstock, and set out pencils and crayons. Beginning February 1st, we write love notes to each member of the family every day, and place them in the buckets. Little ones that can’t write yet draw pictures, and ask for help to spell words. I like to add a little candy in with my notes! We keep our Love Buckets out on a counter or shelf, and excitement builds every day as they can see the piles of notes grow and even bulge out of the pails. On Valentine’s Day, after our special dinner, we all sit down together and look through our pails. I liken the revealing of the love buckets to Christmas morning–their little cheeks brighten with anticipation, and big grins tug across their faces as they read what their siblings and parents wrote about them. The feeling in the air is indescribable, and it’s just a really extra special time. It’s a very simple yet meaningful way to share appreciation and love with each other, and it’s most definitely one of my favorite traditions of all. ♥ Check for pails at your local hobby or craft store, even the dollar store. If you look around Valentine’s Day, you should be able to find them in red, pink, and white. The metal ones are really cute to! Check on Amazon too…I found these! 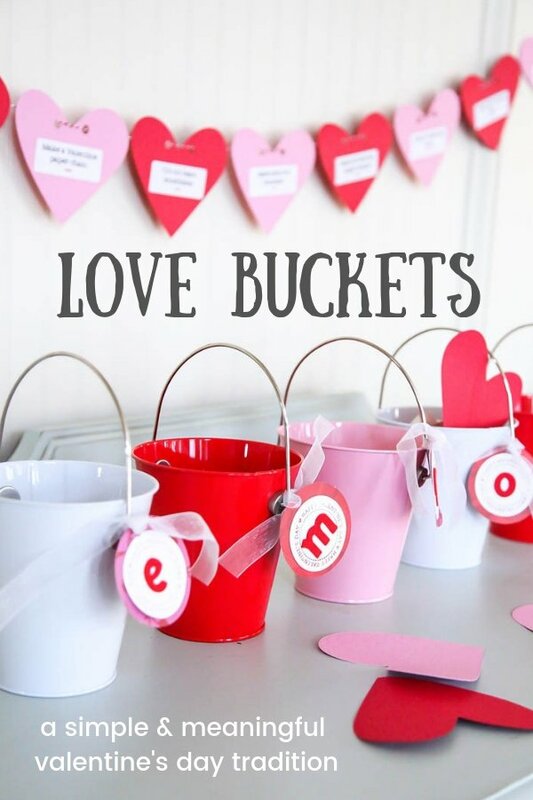 ♥ Add names or initials to your buckets so everyone knows whose they are! ♥ Place vinyl lettering or write directly on the bucket. ♥ Print your kids’ names or initials on out white cardstock (cute alphabet stickers work well too! ), cut out into a rectangle or square shape (or use a circle punch for a circle), then mat onto a cute piece of scrapbook paper. Punch a hole in the top, and use ribbon or twine to attach to the handle of the pail. 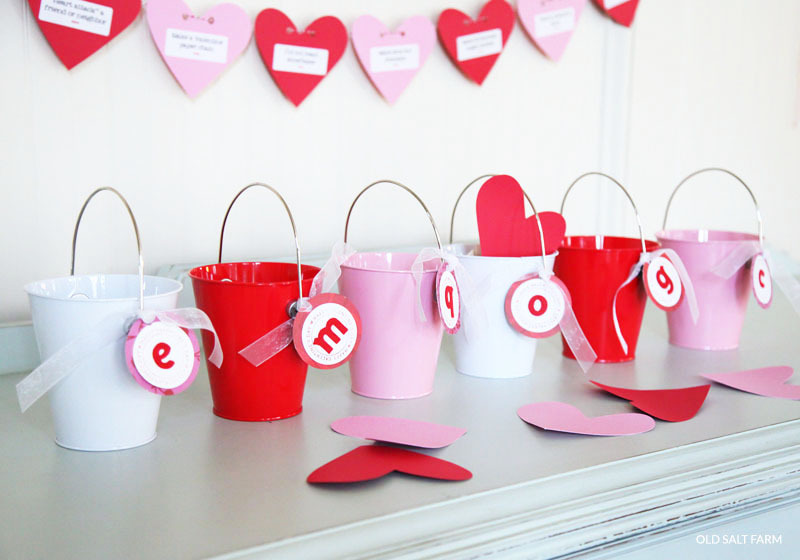 ♥ Create a Valentine tree! Gather branches from around your backyard and place them in a pitcher. Cut out hearts from colored paper, punch holes in the top, then set them out with pens or markers. Write love notes on the hearts, then hang them on the tree! ♥ Make a love rug! My sister’s family uses one, and loves it. She found a cute Valentine rug that they have each member of the family takes a turn sit on, and they go around and everyone says something they love about the person on the rug. ♥ Decorate bedroom doors with hearts! Cut out a bunch of hearts in all sizes, and then each night, place a heart on each child’s bedroom with something you love written on it. If more than one child is in the room, just write names at the top of the hearts. Other members of the family can add them too! Precious!!! Now I must get a Silhouette! I absolutely ADORE that idea … and my kids would love to get some love notes. Hope you don't mind if I steal the idea! We do this and I always look forward to it. It's a tradition that will be very meaningful to your family. What a cute idea–I love that you are making Valentine's special! I found a link to your blog at Scissors & Spatulas, http://www.scissorsandspatulas.com/. I'm now following, and am glad I found your blog. I haven't even had time to *start* Valentine's Day crafts! LOVE the buckets! Wanted to let you know that I have awarded you with the Versatile Blogger Award. You can read about it here. LOVE it! I'd also love to know what font you used for the names! :) Thanks!! MJ–The font is century gothic, my favorite plain font! love this and plan to make these for my 2 little girls….what a fun idea. thank you! Love this idea! I linked to this craft on my new blog! THANKS for your ideas and tutorials! The Love Buckets are such a cute idea..you have inspired me to make some! !